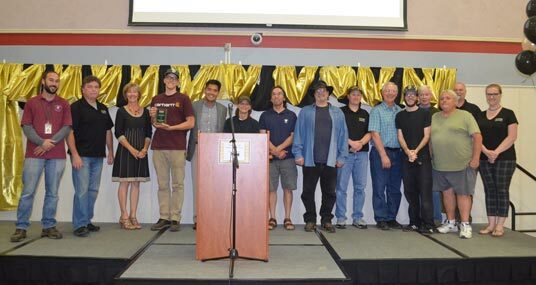 Based on their commitment and drive to provide high-quality services, County Superintendent of Schools, Dr. Ed Manansala, honored the El Dorado County Office of Education (EDCOE) Facilities and Maintenance team with the Excellence in Education Award for the 2017-18 school year. The award recognizes hard work that contributes to providing quality support and services to students, schools, families, and the community. The Facilities and Maintenance Department provides services to a large area from the West part of El Dorado Hills, South Lake Tahoe, and Georgetown. Facilities and Maintenance team members ensure that the environment and workspaces are safe and clean for students and staff. Their work includes a wide variety of tasks including facility repairs, vacuuming carpet, taking out the trash, sorting recycled materials, and so much more. The Warehouse facilitates deliveries throughout the county, record retention, delivery of supplies, etc. Facilities and Maintenance is comprised of 14 team members and includes six who work during the day and eight who work at night. Great work Facilities and Maintenance!